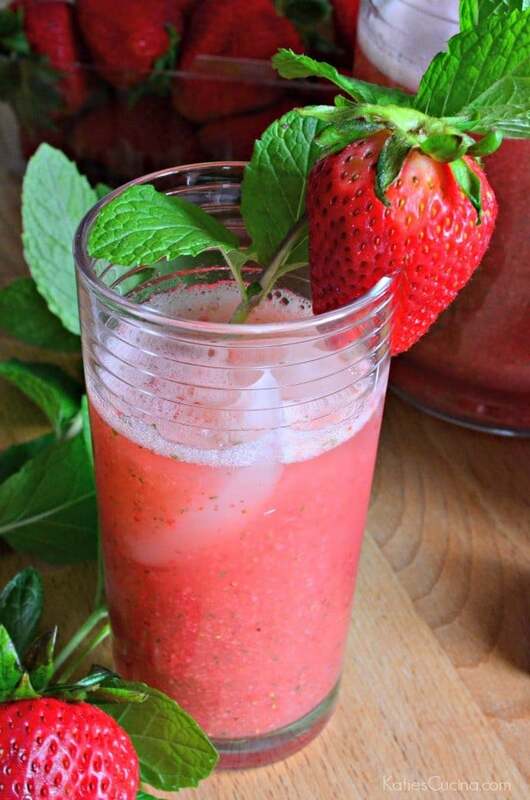 Make your own Strawberry Mint Sparkling Soda at home in just minutes using a 4 ingredients. The perfect refreshing beverage to keep cool this summer! Get ready for the most refreshing glass of soda you’ll ever have in your life. This isn’t conventional soda that is laced with corn syrup and all things bad. This is a fresh fruit soda made of just 4 simple ingredients. Yes, this soda does have sugar but for an entire pitcher of soda you only have a whopping 2 tablespoons of granulated white sugar. But to be honest if your strawberries are super sweet you probably won’t even need the granulated sugar. The day I made this soda my strawberries weren’t as sweet as past batches I’ve purchased. So I felt that the sugar was needed. But the following time I made this soda the strawberries were super sweet. While blending the strawberries I added in fresh mint. I’ll note that I normally would want to strain out the seeds of the pureed strawberry. However, I didn’t find that the seeds bothered me in this soda. I believe it’s because most were blended so fine that they weren’t visible nor recognizable to taste. Now, back to that mint. We have an abundance of it right now in my garden. I’m trying to add it to whatever I can so that it doesn’t get wasted like it does most years. And what makes this soda a soda is the bubbly club soda. That’s what gives the fizz needed to make you feel like your drinking soda. 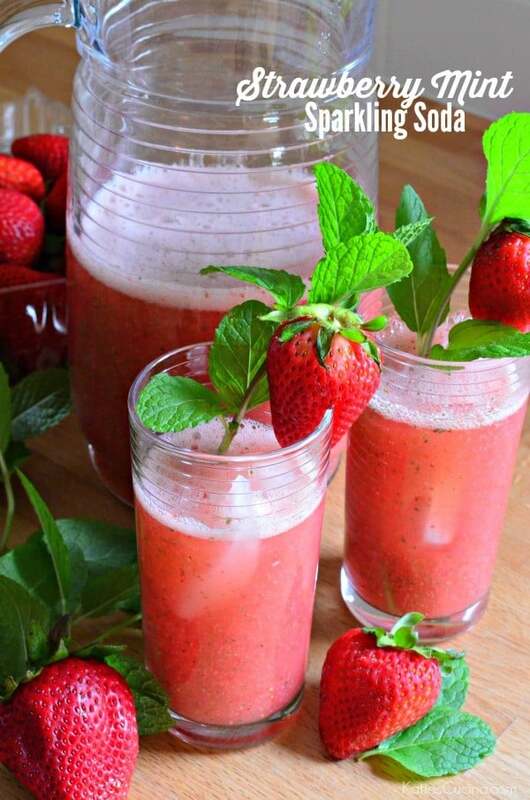 So if your looking for a refreshing and “healthier” version of soda to sip on poolside this summer this Strawberry Mint Sparkling Soda is the soda you should try! Clean, cut stems off, and hull strawberries. Place in blender with powdered sugar and fresh mint leaves. Then blend for 30 seconds until completely pureed. 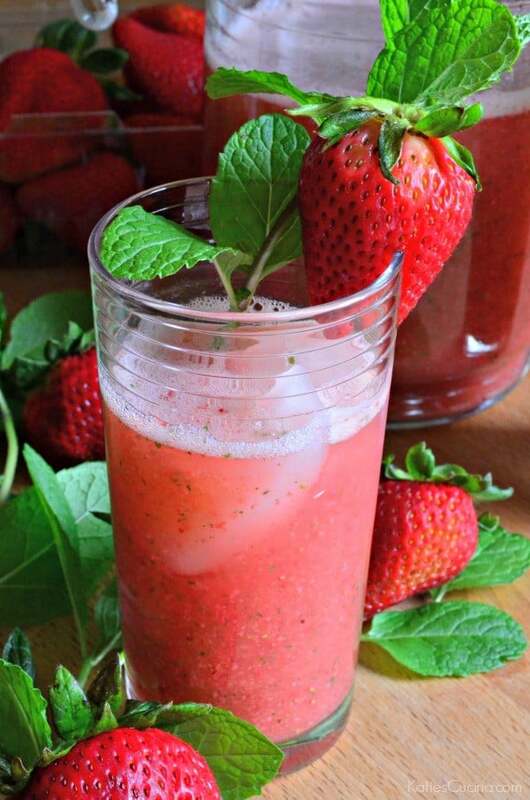 You should have about 2 cups of strawberry mint puree. Pour the 4 cups club soda into the blender and blend for 10 seconds until well mixed. 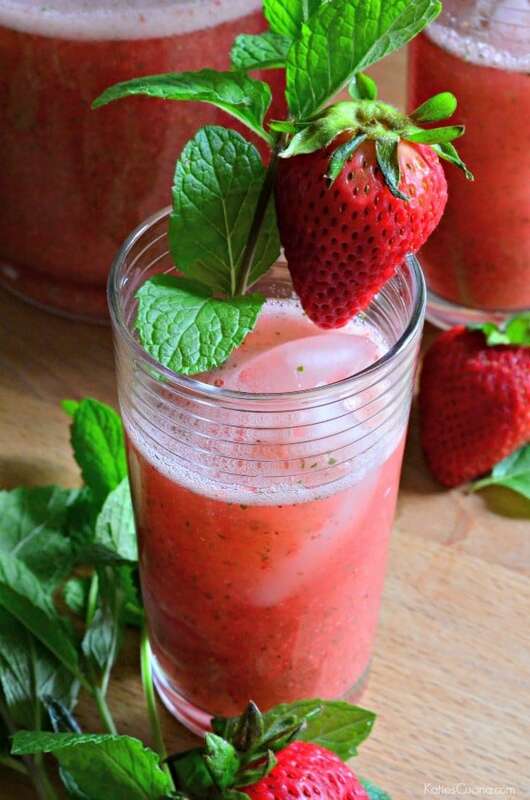 Place ice cubes in cups, divide evenly among the cups and garnish with fresh strawberry and mint sprigs. Enjoy immediately. Amazingly easy and amazingly refreshing!